We’re excited to announce the availability of Adaptive eBooks feature on ScootPad. Students can now read grade-aligned eBooks auto-assigned to them from their eBook Learning Paths while answering built-in comprehension questions along the way. Each student can read independently at his/her own pace progressing automatically along the assigned learning path with no teacher/parent intervention. Adaptive reading is made possible with eBook Learning Paths now available for all K-8 grades, each with grade aligned fiction and non-fiction eBooks with built-in comprehension questions. You also have the ability to create your own eBook learning paths using our library of 500+ eBooks. District & School Administrators can easily design eBook learning paths and seamlessly share them with teachers to adopt in classrooms. Powered by eBook Learning Paths, students can simply launch their next eBook to read directly from their dashboard. Students are automatically prompted with comprehension questions along the way ensuring each students’ comprehension level with GRL-aligned understanding of the curriculum. Each eBook in our library is now equipped with built-in comprehension questions to assess student comprehension in-line through out the book (unlike most other solutions which assess only at the end of the book). 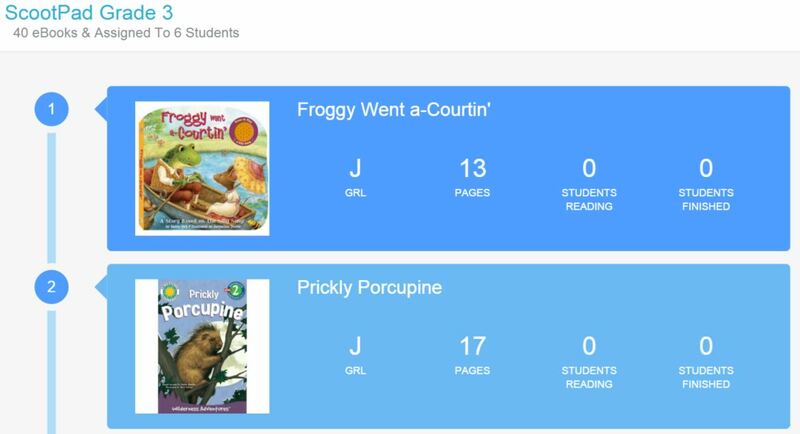 Easily assign any eBook from our library and let ScootPad make sure students read and comprehend each eBook. If built-in questions are not enough, you can even add your own custom open-ended questions and challenge students to submit creative written responses. As students continue their reading journey along the eBook learning path, ScootPad automatically tracks and analyzes valuable data that you can use to easily measure your students’ reading quantity, complexity, and comprehension in real-time. Students can now easily flip pages (swipe on touch devices) and zoom in/out of the text on any tablet device or computer. Our auto-bookmark feature let’s students resume reading from the page they last read without needing to manually bookmark. We hope these new features will further enhance the love for reading in your students. eBook learning paths are now available to ALL Ultra Premium licensed classrooms. New classrooms and newly enrolled students will automatically be assigned their grade-appropriate eBook Learning Path. Existing classrooms that wish to take advantage of these new features are requested to follow these steps to assign an eBook learning path to their students. 2015 Review. Looking Towards 2016.